You can find the East Boston Land Use Council meeting schedule at eastboston.com. East Boston Savings Bank's 23rd annual employee auction raised $25,000 through the sale of employee- and vendor-donated items, including tickets to sporting events, restaurant gift certificates, homemade arts and crafts and toys. This year's auction chair was Paul Cheremka, assistant vice president of residential lending. The proceeds were divided among four area charities: Crossroads Family Shelter in East Boston, East Boston Social Centers, Help for Abused Women and their Children (HAWC) in Salem and Haven from Hunger in Peabody. "The auction is an event that our employees look forward to and take great pride in," said EBSB Chairman and CEO Richard J. Gavegnano. "We're proud of the role we play as a good neighbor in the communities we serve and our employees and vendors continue to be supportive of those efforts." Save the world! Eat your dog! It's ok to have rabbits if you eat them! BOSTON, MA – The Board of Election Commissioners reminds all voters that absentee ballots are now available for the Special State Election for United States Senator, scheduled for January 19, 2010. Since an application for an absentee ballot must be submitted by each voter, the Board advises all residents considering the use of an absentee ballot in January to act now, in order to allow time for the ballot to be mailed and returned. Given the unpredictability of January weather, voters – especially the elderly or those with mobility problems – may want to consider using an absentee ballot for this election. Voters who have used absentee ballots in the past are reminded that a new application must be filled out each calendar year. Applications may be obtained by calling the Boston Election Department at 617-635-3767, or through the Department’s website: www.cityofboston.gov/elections. If a voter is unsure as to whether or not an absentee ballot request is up-to-date, he or she should contact the Department. The last day to register to vote, change one’s voting address or political party affiliation for the January 19, 2010 election, is December 30, 2009. The Election Department, Room 241 at Boston City Hall, will be open until 8PM that evening to accommodate prospective registrants and those wishing to make changes. Those who wish to register or make changes by mail should make sure that their request is postmarked no later than December 30, 2009. Massachusetts Law does not allow these changes to be made via e-mail. To the residents of East Boston, the faded townhouse on a working class block is just a house. But to Iran’s ruling regime, it is the epicenter of a foreign plot to overthrow its Islamic government. The house belongs to Gene Sharp, an 81-year-old author whose books on the use of nonviolent methods to undermine authoritarian rule have been read by would-be revolutionaries all over the world. In the wake of widespread protests in Iran after a disputed presidential election, a mass indictment accused more than 100 Iranian politicians and activists of following the instructions of Sharp, as well as spying for several other US academics. So far, about 80 of the accused have received prison sentences, while at least one has been sentenced to death. The indictment, which appears to target Iranians with connections to the West, has led to soul-searching among some US scholars, some whom have curtailed communications with Iranian dissidents to avoid putting them in jeopardy. Others, like Sharp, see the charges as a badge of honor, and a sign that their arguments are hitting home. They have no intention of scaling back their activities. More on Gene Sharp from the Wall Street Journal. Joseph Tierney: "Joseph Tierney, former Boston City Council president and candidate for mayor died of cancer at his Hyde Park home. Though respected for his ability to craft policy and pore over the city budget, "Joe's legacy really was working very hard for constituents," Flynn said. "He was deeply committed to anyone who called on the phone," said Flynn, who knew Mr. Tierney since childhood, having grown up in a different South Boston neighborhood. "Anybody who called up, he'd go to bat for them and try to help them as best he could." That was true for family members, too, said his son, Joseph, of Milton. "He was just a phone call away for anything from a question about your house to advice on a relationship," he said. "Anything we needed, he'd help us get it." Also, unlike those for whom law school and elective office are excuses to set aside a humble past, "the thing I remember as if it were yesterday is that Joe never forgot where he came from," said Larry DiCara, a lawyer with the Boston firm Nixon Peabody who was elected alongside Mr. Tierney in 1971, each to a first council term. "That came through time and time again." 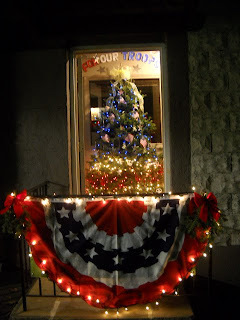 East Boston, MA.14-December-2009 East Boston Main Streets and the East Boston Chamber of Commerce are proud to announce that Danilchuck Auto Body at 73 Addison Street has won top honors in the Fourth Annual Holiday Window Contest. Al’s Shoe Store at 225 Border Street. East Boston Main Streets and the East Boston Chamber of Commerce would like to thank all businesses who have participated and have helped to brighten up the business districts in East Boston. East Boston Savings Bank and Meridian Interstate Bancorp. The East Boston Chamber of Commerce first informed City Councilor Sal LaMattina, Chairperson of the Council?s Transportation Committee, in mid-2008 of the large volume of neighborhood parking issues being logged by the Chamber from local business owners. Working with Councilor LaMattina and Boston Transportation Department (BTD) Commissioner Thomas Tinlin, the Chamber hosted a forum in early 2009 at Maverick Landing, where business owners shared their stories and expressed their concerns. Two months ago, the Chamber invited Commissioner Tinlin to take part in a walking tour of the neighborhood?s business districts; he welcomed the opportunity. 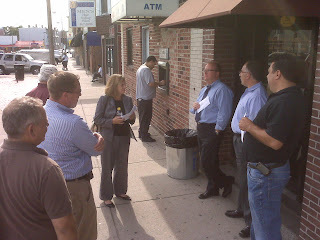 Several BTD representatives led by Commissioner Tinlin, along with Chamber President Angelo Vigliotta, Jr., Chamber director John Dudley, East Boston Main Street director Clark Moulaison, and Janet Knott from the Office of Councilor LaMattina, took to each of the four major East Boston business districts ? Central, Day, Maverick, and Orient Heights Squares. The group made stops at several merchants in each square and took notes. Several issues were identified by the Chamber: these issues have been already, or are in the process of, being addressed by BTD. Included in this list were: a problematic, dangerous intersection at the corner of Bremen and Maverick Streets, which had no stop signs, unclear parking signage, and potential for increased customer parking; a lack of two-hour visitor limits along Meridian Street, to turn over parking for merchants? customers; faded commercial signage in Day Square; and need for increased parking enforcement in sections of Central Square and Orient Heights. ?The Chamber would like to thank Commissioner Tinlin and Councilor LaMattina for their time and concern for our business community. They are helping us create a setting that will make it easier for our members and other businesses to operate and satisfy customers," said Chamber President Angelo Vigliotta, Jr. "We will continue to work closely with them moving forward," he added. 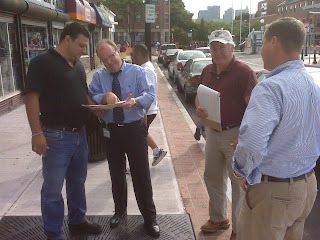 For more information on the East Boston Chamber of Commerce, please call 617-569-5000 or visit www.EastBostonChamber.com. Commissioner Thomas Tinlin and staff join Chamber members and representatives from Councilor Sal LaMattina?s office and East Boston Main Streets in Day Square. Photo 271: Chamber President Angelo Vigliotta, Jr., with Commissioner Thomas Tinlin and BTD staff in Maverick Square. Chamber President Angelo Vigliotta, Jr., with Commissioner Thomas Tinlin and BTD staff in Maverick Square. BOSTON – December 14, 2009 – The Patrick Administration’s Office of Consumer Affairs and Business Regulation announced today that the Division of Banks has ordered six state-licensed check cashers to terminate partnerships with out-of-state banks to charge Social Security recipients exorbitant fees to cash and access their benefit checks. Under these arrangements, check cashers would market the establishment of direct deposit services at their locations and create a limited-purpose account with an out-of-state bank to allow for the direct deposit of customers’ Social Security or other government benefit checks. Approximately 2,700 Massachusetts residents had established these accounts, even though Massachusetts banks and credit unions are required by law to cash Social Security and pension checks at no cost to the consumer. The out-of-state banks routinely charged between $4 and $4.95 each time a Social Security benefit check was electronically deposited into one of these accounts. These so-called limited-purpose accounts did not provide an access device for customers. Accordingly, consumers were dependent upon the participating check cashers to access their funds once deposited in the out-of-state banks. Check cashers were provided with the ability to write checks on the accounts by the out-of-state banks and typically charged consumers an additional fee ranging from 2 percent to 2.8 percent of the face value of any check created to access funds. Commissioner of Banks Steven L. Antonakes said that the partnerships between the out-of-state banks and check cashers were discovered during routine examinations of the check cashers. Check cashers entering into formal consent orders with the Division include Boston Check Cashers and its 20 Boston area locations; Cassie H. Farmer d/b/a Family Financial Center, in Framingham; JMT Check Cashing, Inc., d/b/a United Check Cashing, in West Springfield; Northeast Check Cashing, Inc., d/b/a The Money Stop, in Worcester; Parras, Inc., d/b/a Ace Cash Express, in Worcester; and Speedy Check, Inc., in Lowell. The out-of-state banks partnering with these licensees were Republic Bank and Trust Company of Louisville, Kentucky, and Bank of Agriculture and Commerce of Stockton, California. The action by the Division will have nationwide ramifications. Subsequent to the release of the Division’s orders, the bank involved in all six Massachusetts check cashers – Republic Bank and Trust Company – announced to check cashers around the country that it was exiting the business. The California bank had previously announced that it was ending all partnerships with check cashers nationally. “What makes these practices even more frustrating is that under existing Massachusetts law, any bank or credit union doing business in the Commonwealth must cash Social Security checks at no cost for all Massachusetts residents,” Commissioner Antonakes said. Massachusetts law requires all banks and credit unions to cash Social Security and other pension benefit checks at no charge, even if the consumer does not have an account. Dan Forte, President of the Massachusetts Bankers Association, urged consumers to establish a secure and insured account at a local bank. Dan Egan, President of the Massachusetts Credit Union League also advised Social Security recipients to save money by establishing a direct deposit account locally. Under the terms of the consent orders, all six check cashers will be required to terminate their relationships with the out-of-state banks and end all advertising that implies that they offer banking accounts. In addition, they must provide a letter to each customer that has established a limited-purpose bank account notifying the customer that the check casher will no longer be able to provide direct deposit services. The check cashers must also notify customers that they can either open up a direct deposit relationship at another bank or credit union, set up a DirectExpress® debit card through the Social Security Administration, or revert to receiving paper checks. They will also advise customers that banks and credit unions in Massachusetts must cash Social Security and other pension checks for free. Consumers with direct deposit relationships with one of these check cashers who have questions, or other consumers receiving Social Security or other pension checks who would like information on alternatives to check cashers, should call the Division’s Consumer Hotline at (800) 495-BANK (2265). WOBURN, EAST BOSTON, MA, ISSUED NOVEMBER 20, 2009…Landmark Structures Corporation, a leading full service General Contractor/Construction Management Company since 1993, anticipates a November completion date for a joint venture renovation project between ZUMIX and the East Boston Community Development Corporation. Landmark Structures has served as General Contractor for the estimated $2 million project that encompasses the renovation of a 9,000 square foot former firehouse at 260 Sumner Street in East Boston into the new home of ZUMIX, a non-profit cultural organization dedicated to building community through music and the arts. ZUMIX and the East Boston Community Development Corporation, in a joint venture, purchased the former fire house from the City of Boston. East Boston coach John Sousa received the first of what he hopes are several nice retirement gifts: the Boston North title. Stanley Greene rushed for a pair of scores as the Jets (8-1) rolled to a 29-0 victory over Madison Park yesterday, clinching the North title. Brandon Amodeo added a 30-yard TD run, while Stephon Lockwood closed out the scoring when he returned an interception 66 yards for a score in the waning moments. This is going to be a big debate in the world of economics. Except that the Austrians seemed to have been telling economists you really can't game the market, or plan an economy. East Boston at it's best! On Thanksgiving Day, Thursday November 26, State Representative Carlo Basile and his family will be hosting 200 members for the third annual "East Boston Community Thanksgiving Day Dinner" at Sacred Heart Church 303 Paris Street, East Boston. place to spend the holiday. Doors open at 10:30 a.m. Dinner served from 11:00-1:30. For transportation please call Celeste by no later than November 24th at 617-913-3332. We regret that the hall is not handicapped accessible. "Once you put in a no-slaughter policy, you have to find a home and another life for the horses," he said. " than to be here as part of this therapeutic program." From the Brockton Enterprise, an East Boston connection to Fort Hood, TX. How East Boston Voted on Election Day 2009! Hard Rock Cafe Boston will host a Rock-N-Roll Benefit for Autism Awareness on Saturday, December 12 at 7 p.m. The event will feature live music by Boston-based band SLIP KID, with Gary Cherone. Cherone is the lead singer of the rock band Extreme and former lead singer of the band Van Halen. SLIP KID is a The Who tribute band, made up of veterans of the Boston music scene, with Gary's former Extreme bandmate, singer/songwriter Paul Mangone on bass, Dana Spellman, on drums, Jeff Calder on the keyboard and on guitar, Gary's brother Mark Cherone. The event will also include a silent auction with proceeds benefiting Autism Speaks, the nation's largest autism science and advocacy organization. Vote for Audissey Guides! Vote For Audissey Guides! East Boston resident Rob Pyles is a local entrepreneur and the founder of Audissey Guides, which is is a finalist in the Forbes Magazine Business Competition. The winner will walk away with $100,000. Last week Forbes flew Rob and Co. to NYC to pitch Audissey Guides to a panel of judges. KEY INFO: You'll receive a confirmation email which you must click on for the vote to register. On Tuesday November 10, 2009 East Boston Main Streets will hold its annual meeting and it is open to the public. East Boston, MA. October 31, 2009 East Boston Main Streets will host its annual meeting on Tuesday November 10, 2009 from 9:00 AM to 1:00 PM at the Main Street office; 146 Maverick Street East Boston. Board members will be on hand to answer questions and provide information on the activities and events the organization is sponsoring. All members are encouraged to attend. For more information call 617.561.1044 or visit www.ebmainstreets.com. About East Boston Main Streets. EBMS is a non-profit corporation. Our mission is to create a more vibrant business district by initiating private and public improvements, promoting commerce, and supporting efforts that improve the quality of life for all who live, work and do business in East Boston. Where to vote on Election Day! WASHINGTON TIMES: The song remains the same! : "In 2008, state officials deemed 100 of 143 schools 'in need of improvement' before Ms. Johnson closed or consolidated chronically inadequate schools. About three-quarters of the city's 135 schools underperform today, but Ms. Johnson has increased the number of seats in well-performing schools." 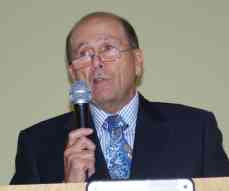 Dr. John Penta was for 25 years, a section of Chief of the National Cancer Institute, National Institutes of Health (NIH). In addition, he was Adjunct Associate Professor of Medicine in the Department of Medicine Division of Medical Oncology at Duke University of School of Medicine. Dr. Penta was involved in clinical research studies evaluating experimental treatments in very sick cancer patients who has short life expectancy and in whom conventional treatment options were exhausted. He was part of national team that developed an active chemotherapy regimen for osteogenic sarcoma in children and young adults in the late 70’s. Tunku's ordeal has a lesson for everyone! David Bavaro may have been the younger, smaller, overlooked football playing Bavaro brother from Danvers. His older brother, Mark, was perceived as one of the toughest tight ends in the history of the National Football League, spent mostly with the New York Giants. He was an All-Pro, a two-time Super Bowl champion and a Pro Football Hall of Fame nominee. 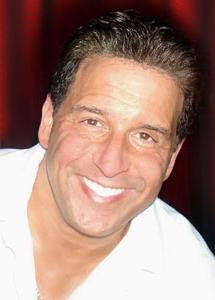 David Bavaro, now a 42-year-old physical education and health teacher at Malden Catholic High School, played five seasons as a physical linebacker in the NFL. He'll be be recognized for athletic achievement with four different NFL clubs and a great college career at Syracuse University when he is inducted in the National Italian-American Hall of Fame's New England chapter on Saturday, Nov. 21, at the Danversport Yacht Club. Voters in November 2008 defeated a previous proposal to create a casino in Oxford County as well as an attempt by the Penobscot and Passamaquoddy Indian tribes to create a $650 million casino in Sanford, Maine, in 2003. But Maine voters did approve a racino, which led to Bangor's Hollywood Slots complex. Rich Killion, a spokesman for Fix It Now NH, a coalition of pro-gambling groups, said New Hampshire would be wise to approve casino gambling before other nearby states because it would give Granite State businesses "a leg up." There are 1.25 million potential customers within 25 miles of Rockingham Park in Salem and another 1.3 million just beyond that radius in the Greater Boston area, he said. "New Hampshire not doing it would allow them to get all the revenue," Killion said of Massachusetts. BOSTON, Oct. 22, 2009 (GLOBE NEWSWIRE) -- Meridian Interstate Bancorp, Inc. (the "Company" or "Meridian") (Nasdaq:EBSB), the holding company for East Boston Savings Bank (the "Bank"), announced net income of $1.9 million or $.09 per share (basic and diluted), for the quarter ended September 30, 2009, compared to net income of $2.1 million, or $.10 per share (basic and diluted) for the quarter ended September 30, 2008. The Company recorded net income of $1.7 million or $.08 per share (basic and diluted) for the nine months ended September 30, 2009, compared to a net loss of $394,000 for the comparable 2008 period. Earnings per share information is not applicable for the nine months ended September 30, 2008, as shares were not outstanding for the entire period. * Total loans increased by $74.7 million, or 10.5% from December 31, 2008. * Deposits increased by $125.2 million, or 15.7% from December 31, 2008. * The net interest margin improved for the sixth consecutive quarter, increasing from 3.18% for the quarter ended June 30, 2009 to 3.35% for the quarter ended September 30, 2009. * To increase the Bank's brand exposure in Suffolk County, the Company initiated a new strategic marketing campaign in September 2009, which is entitled "Hard Work" and highlights the Bank's community focus and commitment to hard work. * In September 2009, the Bank hosted an open house at its newest branch in Medford, MA, bringing the number of locations to provide convenient customer service to 13. Richard J. Gavegnano, Chairman and Chief Executive Officer of the Company, noted that, "The Bank continues to see great opportunities in lending and healthy growth in deposits. Yields on new loans remain stable, and the Bank's cost of funds has decreased sharply, enhancing net interest income. Our capital position is a source of stability for the Bank and provides us the ability to capture relationships from customers disaffected by larger institutions." Meanwhile, the stock closed at $8.61 today. Halloween Party at District A7: Police hold fun Friday session for kids! TRICK OR TREAT ON PARIS STREET! WHO: Boston Police Captain Robert Cunningham along with police officers from District A7 parents and trick-or-treaters 13 years and under. Captain Cunningham will also be available to provide Halloween Safety Tips. For additional police-sponsored Halloween activities in other districts citywide, please visit bpdnews.com. Eastie Women Connect:: Public Speaking for Busy People"
President of Mimi Goss Communications, Inc. Registration will begin at 5:45PM. The EWC will be serving a light supper at 6:00PM, courtesy of generous donations by Italian Express Pizzeria and Scup’s in the Harbor, with space and equipment accommodations provided by Atlantic Works and Piers Park Sailing Center. The presentation will begin at 6:30PM. Attendees are encouraged to bring plenty of business cards and other materials for networking purposes. Tickets are now available, $20 per person. Makes everything possible. Fear not, my friends, we are good hands with the folks who brought us "hope and change." On Thursday, November 19, in the Topsider Room at Suffolk Downs, the East Boston Chamber of Commerce is hosting its first-ever Comedy Cabaret Night. Open to the public, come enjoy a warm and entertaining evening, headlined by a performance of unparalleled celebrity impersonator and singer Joey Canzano, who captures the likes of Frank Sinatra, Dean Martin, Tom Jones, and Elvis Presley, among others. The night also features one-of-a-kind comedian Paul Gilligan and a buffet dinner. You’ll feel like you’re in Las Vegas! The evening starts at 7:00pm, with buffet dinner beginning promptly at 7:30pm. The comedy cabaret begins at 8:00pm. Tickets are just $35 per person. Reserved tables of ten are available as well. To purchase tickets, please contact members of the Chamber Board of Directors or call the Chamber directly at 617-569-5000. For additional information and audio samples of Joey Canzano, please visit www.JoeyCanzano.com. For information on the Chamber, please visit www.EastBostonChamber.com. On Wednesday September 23, 2009 Representatives from Sovereign Bank presented East Boston Main Streets with a check to support their efforts in improving the community. EastBoston, MA.23-September-2009 East Boston Main Streets received a grant from its Corporate Buddy Sovereign Bank. Sovereign Bank has provided annual grants to East Boston Main Streets as part of its commitment to community reinvestment. Managers Carolina Monney and Antonio Pineda were on hand with Main Street board members to accept the support. Ana DiMaria, President of East Boston Main Streets and Mike Moscone, Main Streets board member thanked Sovereign Bank for their support. Special thanks to East Boston branch employees, Loida Morales, Christopher Stewart, Marlende St. Louis and Ron Baker. The staff has volunteered many hours during the year to help beautify East Boston and promote local businesses. October 2009 is Italian Heritage Month in Massachusetts! The Italian Heritage Month Committee is pleased to celebrate the 11th year of October as Italian Heritage Month. A kick-off event is planned on Thursday, October 1, 2009 at the State House in Boston. Nurses Hall will be filled with those celebrating the many contributions by Italians and Italian Americans throughout the centuries. Participants will be eagerly awaiting the reading of the Governor's Proclamation, the musical performances and heartfelt words from local dignitaries. This event is free and open to the public. We look forward to seeing you there. But, remember that October 1st is just the beginning! The month-long celebration will have events planned throughout the State and it will not be difficult to find something to please the diverse tastes of all those who join us in celebrating this year. Celebrate and explore the history, culture, language, genius, artistry, and centuries of discoveries and accomplishments. Please see www.ItalianHeritageMonth.com for a complete list of events. East Boston Chamber releases letter of support for casino at Suffolk Downs. Forget about that long-sought Blue Line extension. Because Massachusetts could not come up with more money for transportation projects, as required by the federal government, 17 projects were eliminated in the Boston metropolitan area, including eight on the North Shore. "We take no pleasure in the dramatic cutbacks included in the new Regional Transportation Plan,” said Marc Draisen, executive director of the Metropolitan Area Planning Council, “but they represent a realistic assessment of funds currently available and likely to be available in future years." Boston Police District A-7 - News: "Crime Summary for September 25th - 27th"
The newly renovated Maverick Square MBTA Station is now open. That's reason enough for local businesses to sponsor a weeklong celebration. Details available at eastboston.com. Eastboston.com is taking a well-deserved but brief vacation. It will be back in full force on Sat., August 8. BPL - East Boston Branch Library: "Frederick Leonard King (American, 1879-1947)"
A lot of good can come from this idea. The East Boston Land Use Council's scheduled has been updated. New meetings scheduled from August through December 2009.